Wanderlust Wayfarer is the perfect place to find out about luxury travel and trends on a shoestring budget. If you like a five-star experience, but you have a three-star budget, I have good news for you. There are plenty of ways to experience the world on a shoestring budget. And you can look good while doing it! Each blog post features a new itinerary with the best ways to spend an amazing dayâ€”or moreâ€”in some of the most spectacular cities and towns across the globe. Each itinerary focuses on packing the most you can into your day. If youâ€™re like me, you have limited time off from work each year, and you want to make the most of it. This means condensing a lot of action into a little bit of time. 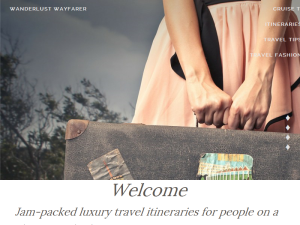 This what your Wanderlust Wayfarer Blog Ad will look like to visitors! Of course you will want to use keywords and ad targeting to get the most out of your ad campaign! So purchase an ad space today before there all gone! The post How to Pack Light Using Compass Rose Packing Cubes appeared first on Wanderlust Wayfarer. The post New Year’s Eve at the London Eye: What to Expect appeared first on Wanderlust Wayfarer. The post Things to Do in Bangkok During a 24-Hour Layover appeared first on Wanderlust Wayfarer. The post Take a Day Trip through the Lavender in Provence appeared first on Wanderlust Wayfarer. The post Plan the Perfect Day Trip to Windsor Castle from London appeared first on Wanderlust Wayfarer. The post 5 Essential Things to Do in Metro Manila appeared first on Wanderlust Wayfarer. If you are the owner of Wanderlust Wayfarer, or someone who enjoys this blog why not upgrade it to a Featured Listing or Permanent Listing?